SPAIN gets under your skin and fingernails. It dries your eyes and your mouth. You can feel it in your hair and on your brow when your boots kick the dust of its white mountain tracks. 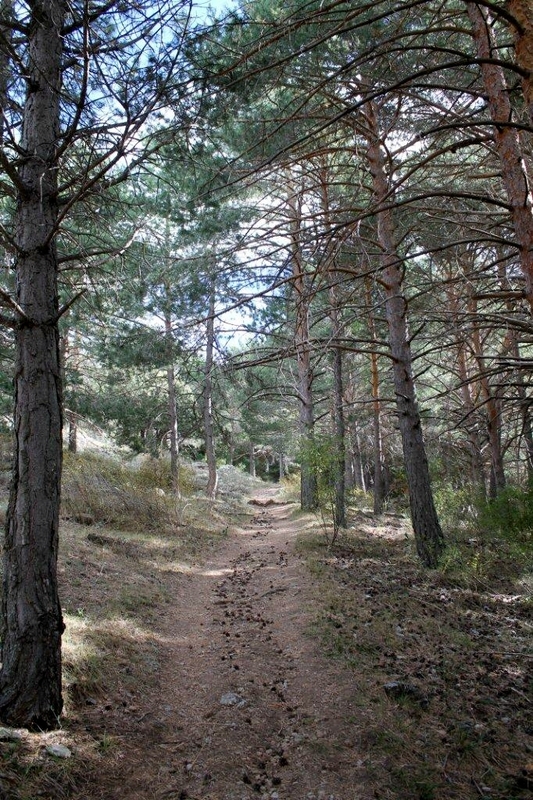 You smell its wild herbs and warm winds drifting through pine woods. And when you sit in the baking sun on its rocky summits, gazing out across deep valleys and hazy plains, you think: I could live here . . . 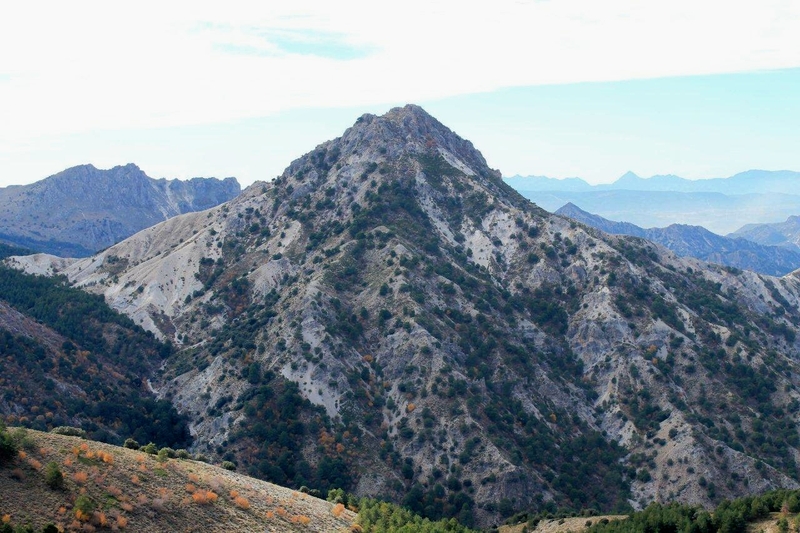 These mountains are the Baja Montaña – the Low Mountains – the eastern foothills of the Sierra Nevada. That’s “low” as in 2,000 metres (6,500ft) of altitude. When the first mountain you climbed was Coniston Old Man (803m, 2,634ft), the Baja Montaña don’t sound very low. 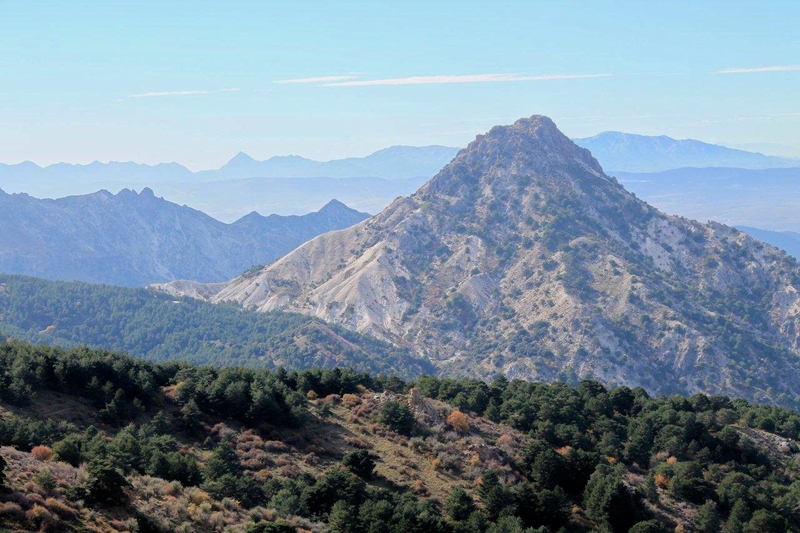 But I’m getting pretty familiar with this area, and having climbed many of the big brutes to the east, I’m hoping that my targets for today will be a gentle reintroduction to the delights of Spain. 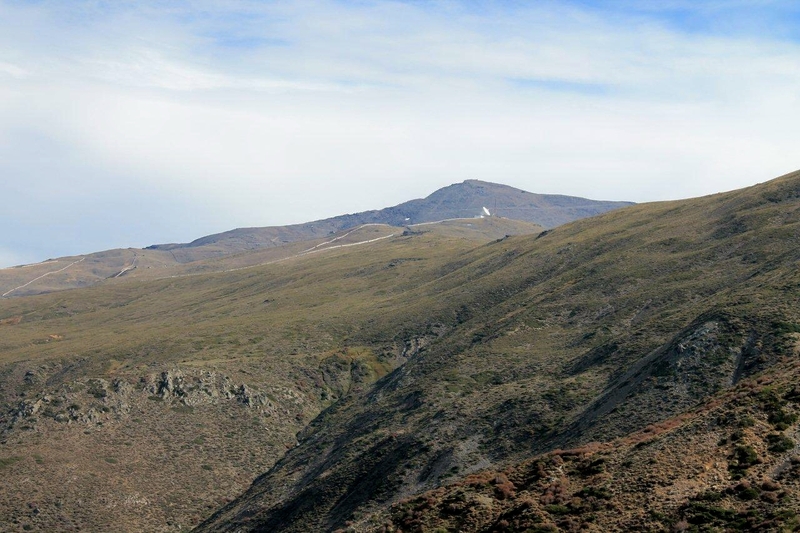 Those targets are Pico del Tosoro (1,994m or 6,541ft) and Cerro del Mirador (2,069m or 6,788ft). To my right looms the wonderfully majestic Cerro del Trevenque (2,097m, 6,879ft). 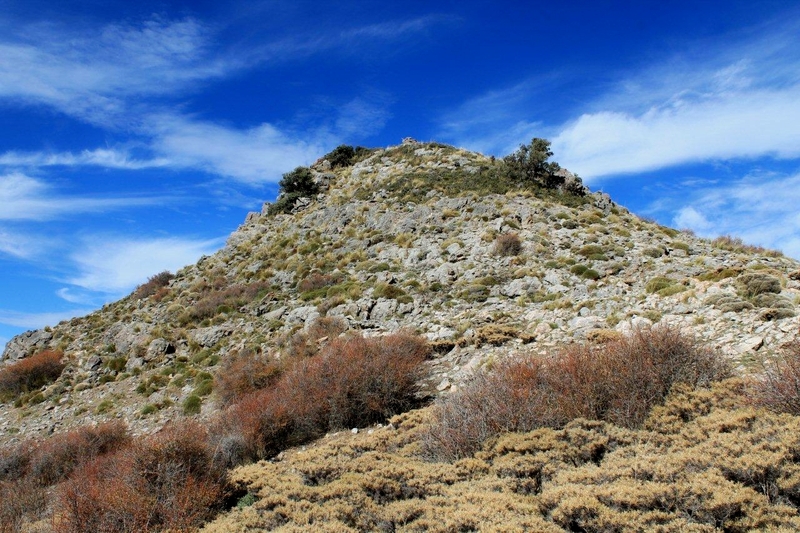 Trevenque is the highest peak in the Baja Montaña and dominates the landscape. If I compiled a list of my five favourite hauntingly beautiful mountains, Trevenque (pictured below) would be up there with Shiehallion, Buachaille Etive Mor, Great Gable and the Matterhorn. There’s only one of those I haven’t climbed, and no prizes for guessing which – but I stood at its foot the day South Korea knocked Italy out of the World Cup. That didn’t go down too well in the local bars, I can tell you. Would you care to join me in a rant? There is no obligation to agree with my comments or participate, but if you would like to respond then please feel free. This is my fifth visit to the Sierra Nevada. Spain has worked its way into my soul. When Mr EasyJet drops me off at Malaga, it feels like I’m coming home. I could live here. But my home is a cold, uncharitable country that has grown progressively peevish, nasty and intolerant in the past few years. Britain is a place where scorn and blame are poured on doctors and nurses for isolated aberrations in the health service; on teachers for schools that fail to compete; on the public sector because it escapes the clutches of private interests; on the unemployed because there are no decent jobs available; on immigrants who seek a better life for themselves and their families; and on social workers because they are easy targets in a system that has been pared to the bone. In Britain, “asylum seeker” has become a derogatory term. Families fleeing persecution in conflicts – several of which were started by British politicians – are automatically branded illegal workshy benefits scroungers by the right-wing press. Blame, blame, blame. Piled on deep. Even on the bloody badgers. And at the other end of the spectrum we have the banks and the energy companies robbing us blind, private armies such as G4S and Serco riding roughshod over democratic law, and criminals Chris Huhne and Vicky Price elevated to celebrity status on their release from prison. How does that work? If your wife or husband was convicted of perverting the course of justice would you expect TV presenters to be interviewing her or him on the comfy settee after their release? “Oh, you’ve written a book about your experiences and the inequalities within the prison system – do tell us about it, dear.” I don’t think so. Hey. 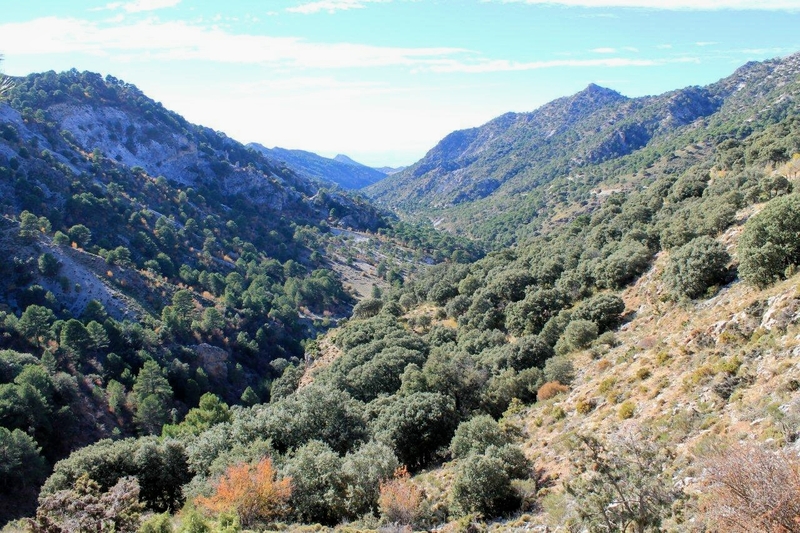 I tramp halfway along the 6km track from Collado Sevilla to Cortijuela – where my route strikes up into the hills – when I realise I could have driven the entire length and parked at the head of the valley. This dawns on me when two cars rumble past, leaving me covered in a film of white dust. I’m not disheartened because the views of Trevenque are spectacular and the sweet November air is thoroughly refreshing. And I rather like being covered in white dust. 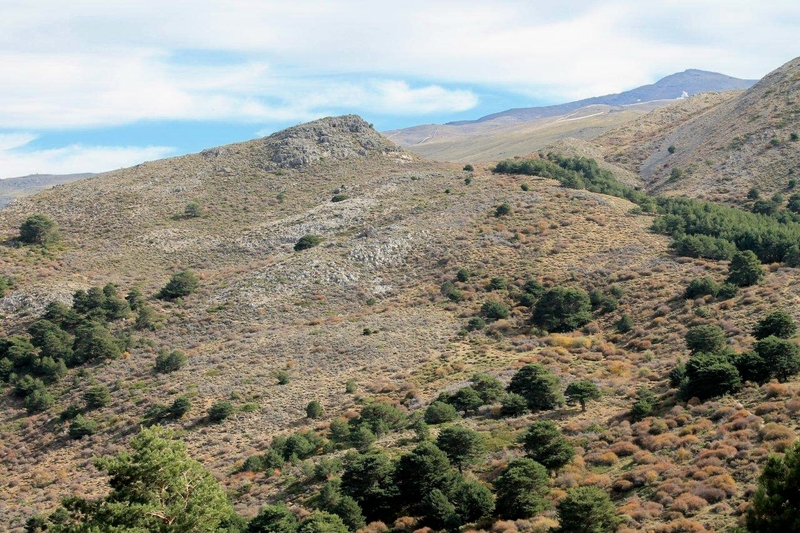 At Cortijuela, believe it or not, there is a botanic garden, which must rank as one of the most remote and inaccessible botanic gardens in the world. Six mountain bikers are arguing noisily by a fountain outside the gate. The Spanish are very passionate when they converse, unlike we Brits. My command of Spanish is less than rudimentary, but I get the impression they are discussing Vicky Pryce’s new book. My route today is an amalgamation and subsequent paring down of two routes in Andy Walmsley’s Walking in the Sierra Nevada (Cicerone), one of the most accurate and descriptive guidebooks on the area, if you ask me. 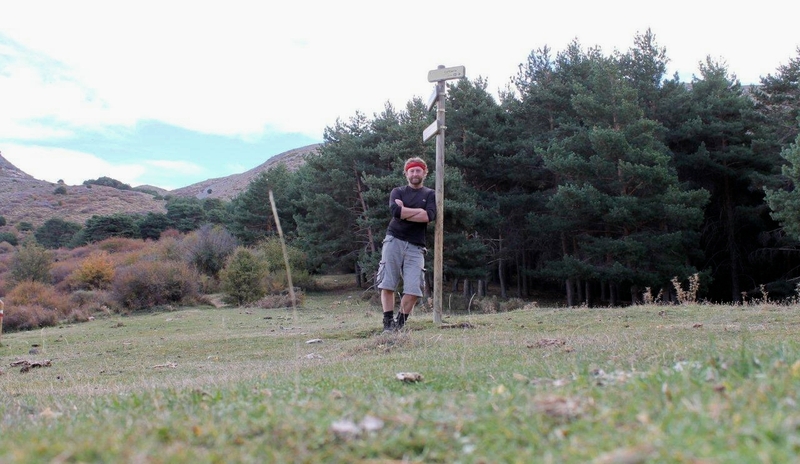 I follow Andy’s route up through the piny forests to the Collado de Matas Verdes (col of the green shrubs), where a solitary three-fingered signpost points to places I’ve never seen on a map. The col is the perfect place to have lunch. 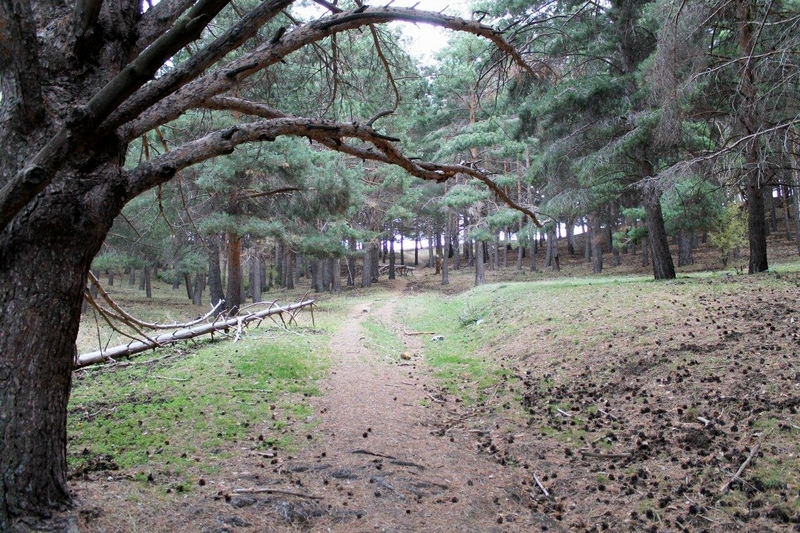 Collado de Matas Verdes is a pleasant green sward with pine trees behind and open vistas to the fore. It would also prove to be a perfect place to spend a night. Is it just me, or do other people stumble upon ideal campsites in the middle of the day or when they have no intention of camping? 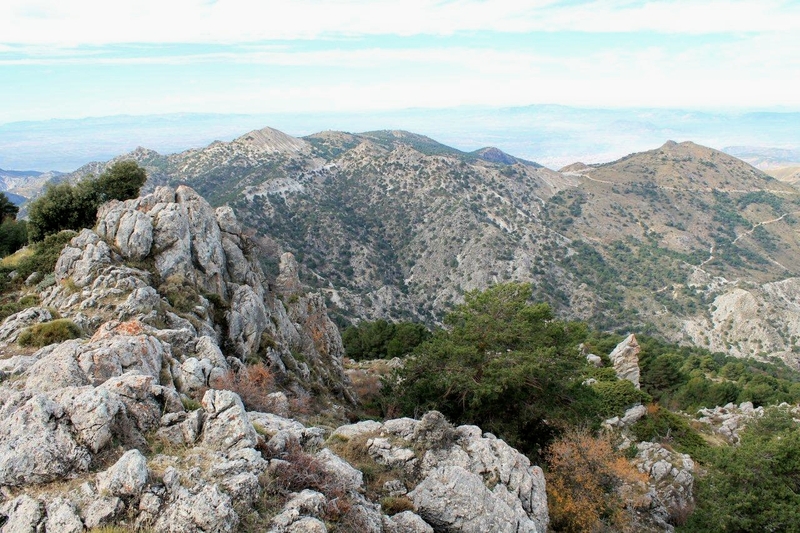 The summit of Pico del Tesoro is a short climb to the north-west through scrub, wild herbs and boulders. 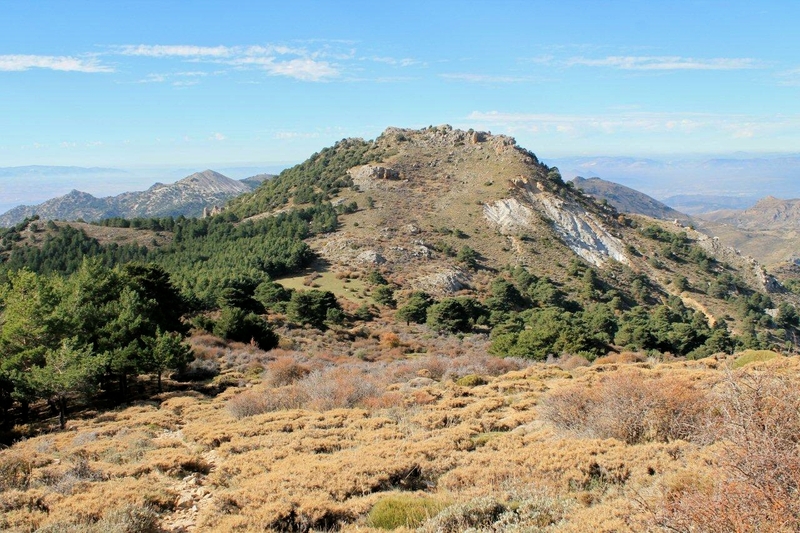 Walmsley says that on the summit there is “much evidence of cabra montes (ibex)”. He is not wrong. And like crusty cow pats, there is no problem if the evidence has spent some time in the sun. 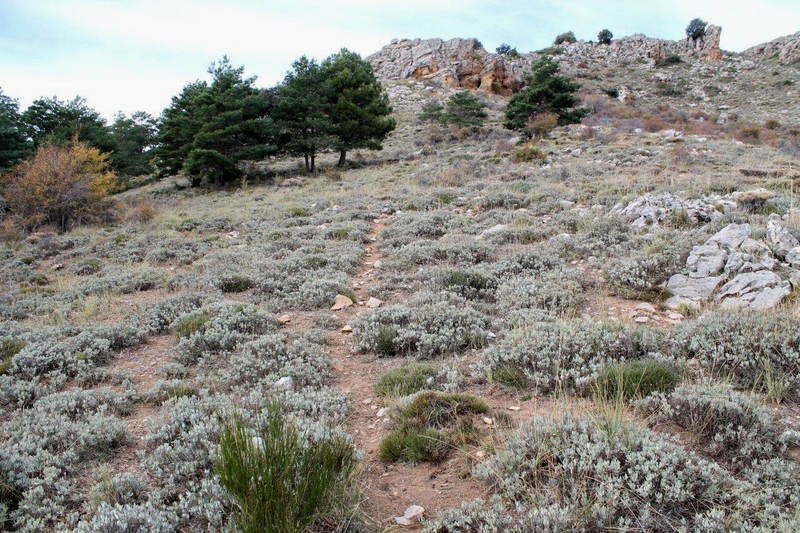 I shuffle back down to Collado de Matas Verdes. Cerro del Mirador lies across to the east. Walmsley says, somewhat unflatteringly, that rather than being a peak in its own right, it’s “only a bump on the side of the huge Loma de Dilar”. 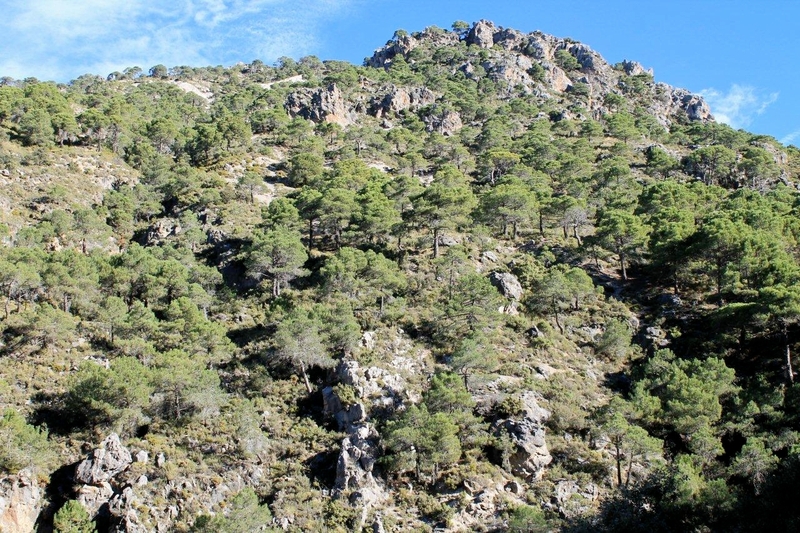 He also says it takes only thirty minutes to climb from Collado de Matas Verdes. That sounds like a challenge to a man who is easily goaded. 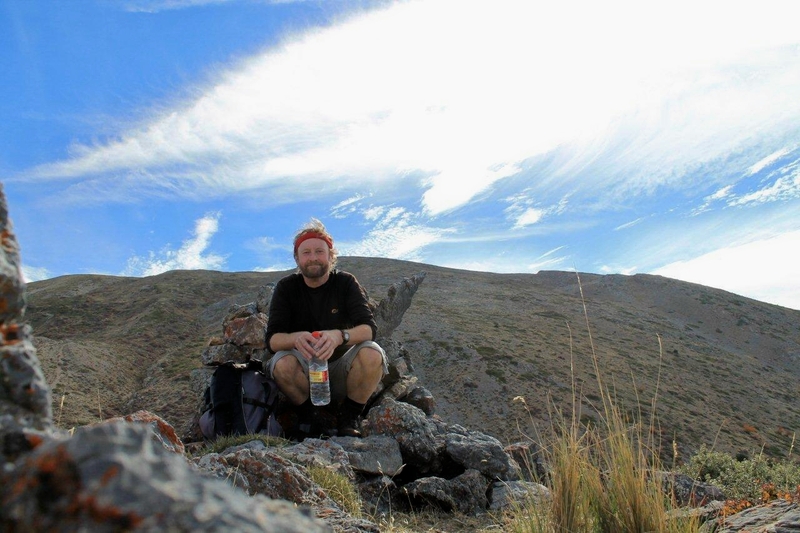 I’m sitting on the summit of Cerro del Mirador within 28 minutes. That might sound like bragging – but I was 57 last month and I have to keep pushing myself like an uncle on a dancefloor at a niece’s wedding because that’s the sort of person I’ve become. You should see me when the DJ plays Come on Eileen. I’m the bloke with the pint in his hand and the open shirt who always asks for the Irish Rover by the Pogues. 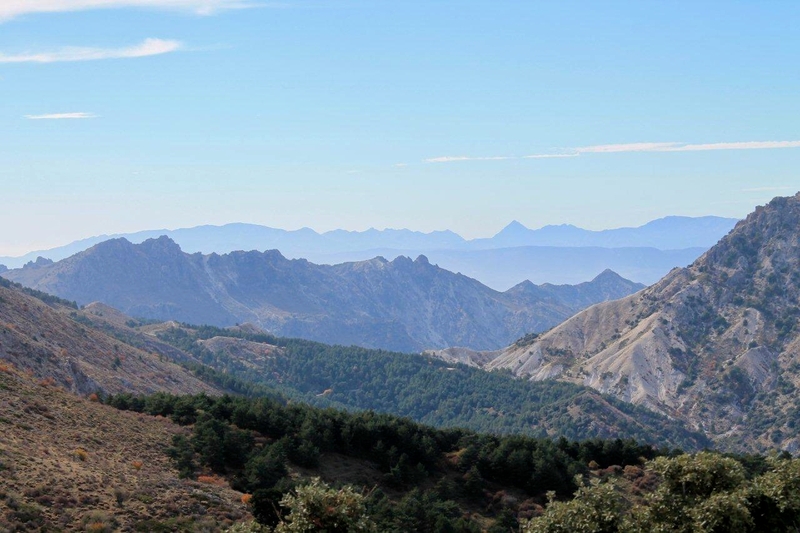 So I sit on the summit of Cerro del Mirador and gaze out across this fantastic panorama of forests and plains to the blue ridges of the Sierra Almijara and think: no country is perfect. Spain has its problems. There is inequality, poverty, unemployment, and a history of bloody conflict between the privileged and the dispossessed that resounds to this day. But it’s a nice place to be – to breathe the air, to tramp through warm dust, to sit on a breezy peak in brilliant sunshine and drift through quiet forests to shaded valleys. And that’s in November. 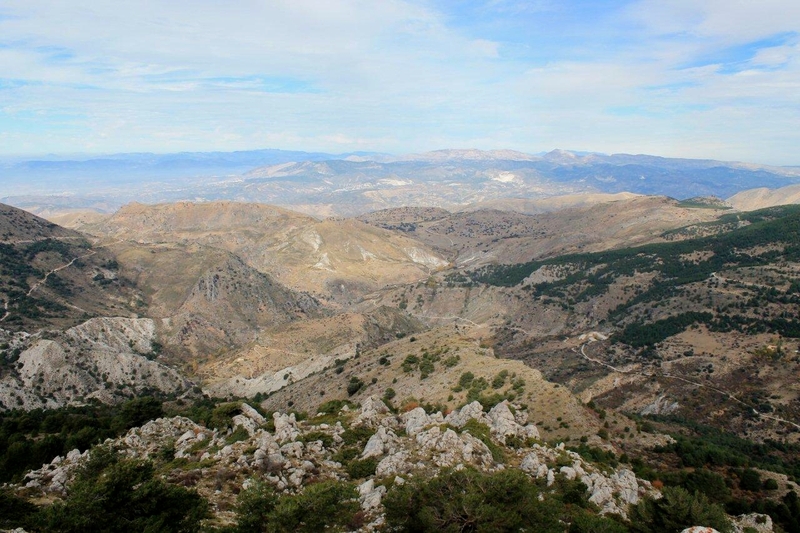 This entry was posted in Camping, Climbing, Environment, Footpaths, Hiking, Mountains, Politics, Ranting, Walking and tagged Munros, outdoors, Sierra Nevada, Sierra Tejeda y Almijara, Spain, The Lakes, WPLongform. Bookmark the permalink. I thoroughly enjoyed that Alen. 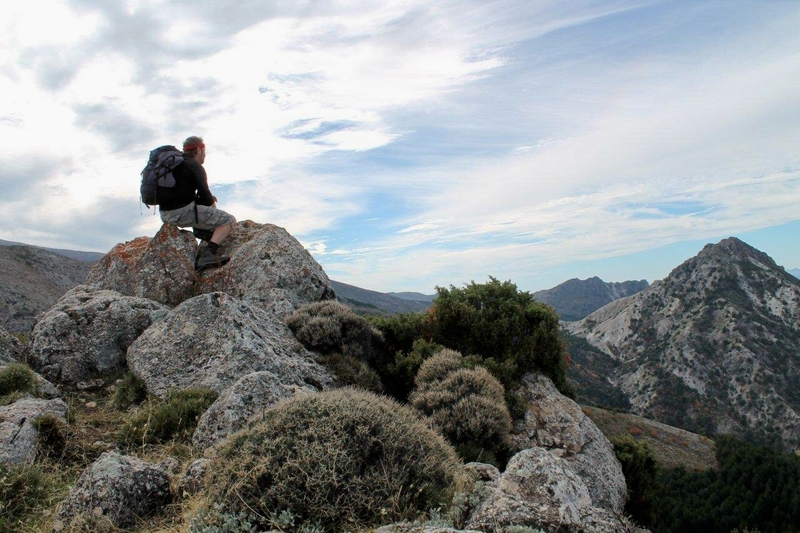 It’s a few years since I was in southern Spain – 2009 in fact and even longer since I stood on mountains like Valeta and Mulhacen. I have always found Spain to be a wonderful place of contrasts, especially as my wife speaks Spanish and we get to see under the surface as it were. Like you say it does get under your skin, yet strangely while we had a look at living there we decided against it for various reasons. France incidentally is the place I really could live in. As for your rant, you are certainly of the same mind as me. Hola amigo. Thanks for that. Spain is a great country and I have developed an affinity with the food, the lifestyle, the weather, the people – basically everything. If I could speak Spanish and had a bit of money put by I’d go there tomorrow and settle down. France too. They know how to savour life to the full do the French. We’ve spent a great deal of time there over the years. In fact, we are long overdue another visit. Meanwhile, the ground is sodden in Barton and Teesdale will soon be snowed under. It makes you wonder what we’re doing over here. Hi Simen. Thank you for that. You are whetting my appetite for a swift return. T-shirts and shorts in January can’t be bad. That’s a great picture with Lanjaron in the background. It’s a nice town, and very handy for climbing Caballo, which I did a couple of years ago. Who knows, I might bump into you over there sometime. Tempting photos, spectacular panoramas. We forget how small some of our mountains are compared to the beasts in Europe. (Not that it makes the likes of Scafell any easier to climb.) I suppose being outdoors in mountains like these would make you question life and everything, but your rant about Britain is pretty spot on. I’ve been to Spain once, ended up at the monastery at Montserrat looking at the road gullies and realising there was nothing underneath them or the road! Plays havoc with the vertigo. Hi Chris. I went on a bus trip to Montserrat when I was 14 and on holiday in Spain with my parents. I don’t recall much about it, but we have some flickery cine film somewhere recording the event. The mountains in the Sierra Nevada are very high, compared with the Lakes, but the roads climb higher too. So these two mountains in this post were probably equivalent to climbing, say, Swirl How and Wetherlam in terms of the effort expended. Mind you, the views are different and the weather is certainly warmer. 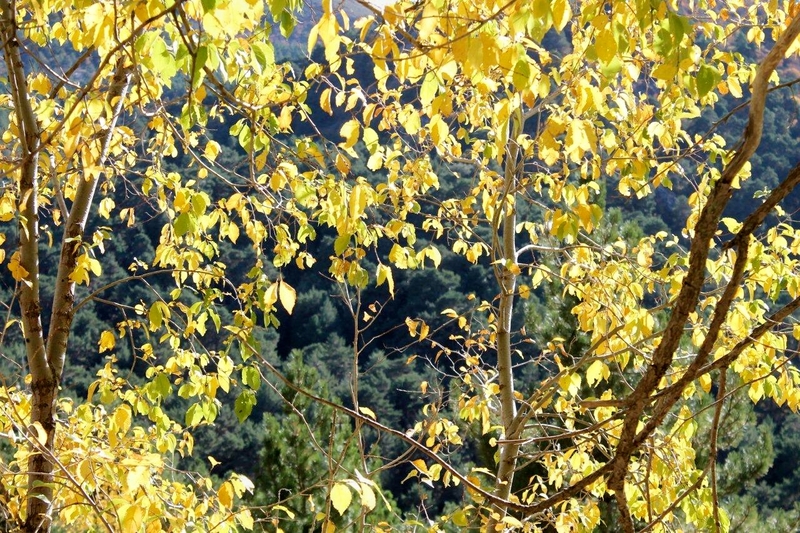 Andalusia in November must be amazing Alen. I can read between the lines that it is just the place to take a holiday now. I have been fortunate to experience Egypt in February. It was magnificent to anticipate spring. Quiet evenings with temperatures of 20 degrees, the birds were singing and flowering shrubs and trees all over the place. Hej Hanna. Egypt in February sounds a very pleasant place to be. It’s a country I have never visited, but I can recommend Morocco in March. On the darker note, companies like G4S as spreading their operations around the world and taking over institutions that were once run by accountable organisations. G4S is in trouble in this country for various transgressions, not least nearly buggering up last year’s Olympic Games through its incompetency. It has also been accused of overcharging the Government millions of pounds for electronically tagging prisoners who are no longer serving sentences or have died. It has declined to have its accounts audited by independent specialists. In South Africa, the control of Manguang state prison has been removed from G4S after its staff were accused of subjecting prisoners to electric shocks and forced injections. That’s where the world’s going. Accountable bodies that ran institutions on behalf of the community are being replaced by unaccountable corporations whose only interest is profit. And on that cheery note . . .
I’m totally jealous now! That looks lovely – what wonderful landscapes (you can see how little rain they have – compared with, say, Glencoe!) I agree with your rant about the inequalities and the ‘celebrity’ status of talentless nobodies who just want their 15 minutes of fame, at whatever cost. I’m watching less and less TV – reality is becoming fiction, and fiction is becoming reality. Or maybe I’m just getting cynical! Talking of which, you’re not doing badly for 57. I am approaching a milestone in January and I have made a resolution to climb a few more mountains! Hi Jo. Thanks for that. Yes, reality TV has become unreality TV, with the grotesque and the brainless being propelled to minor celebrity status – like that thick sod from The Only Way is Essex who can’t even tell the time. I watch very little TV because although there are far more channels than there used to be there seems to be less variety than ever. Hope your milestone isn’t too painful. Ah, but at least on Strictly the contestants have to be dedicated and talented to succeed. Plus, my wife sits glued to it as well so it’s always on in out house – though I pretend not to watch it. Hi Carol. The desert sounds very appealing. Buy some boots that don’t let the sand in. Britain is a grey and unpleasant country I like increasdingly less every time I visit France and Spain where the sun shines and there’s a companionable civic spirit. 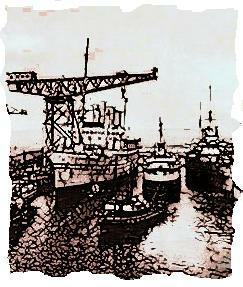 Foul politicians, teacher bashing, greedy utility companies, Soviet style transport with capitalist prices – the price of everything in fact, so grossly expensive in relation to the (crap) quality of UK life. Which I think is partly because of supply and demand overcrowding. 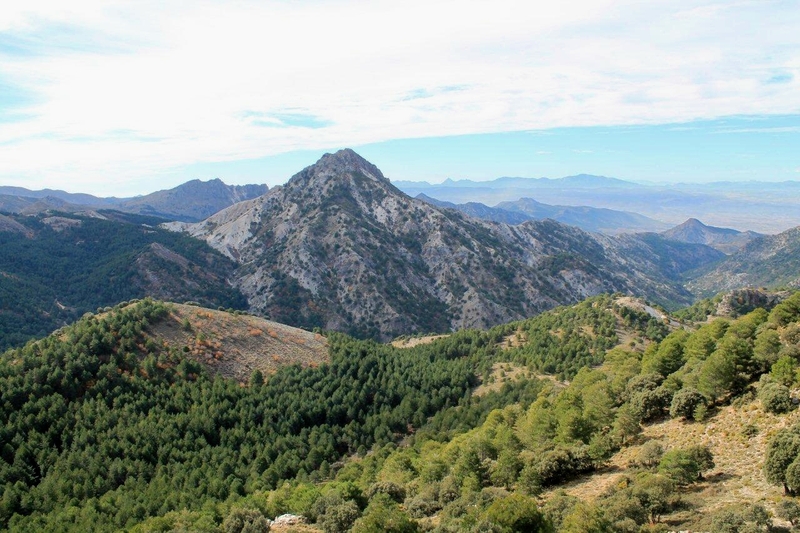 But yes, these southern Spain mountains…I’ve been dipping into a few books and web sites for a few years now every time dark winter days arrive and I’m hanging on to memories of a recent Pyrenean summer. They do look a lovely and timely Great Escape. Hi James. I’m glad it’s not just me who thinks that way. This country is really getting me down – and with winter coming it’s just adding to my dark mood. 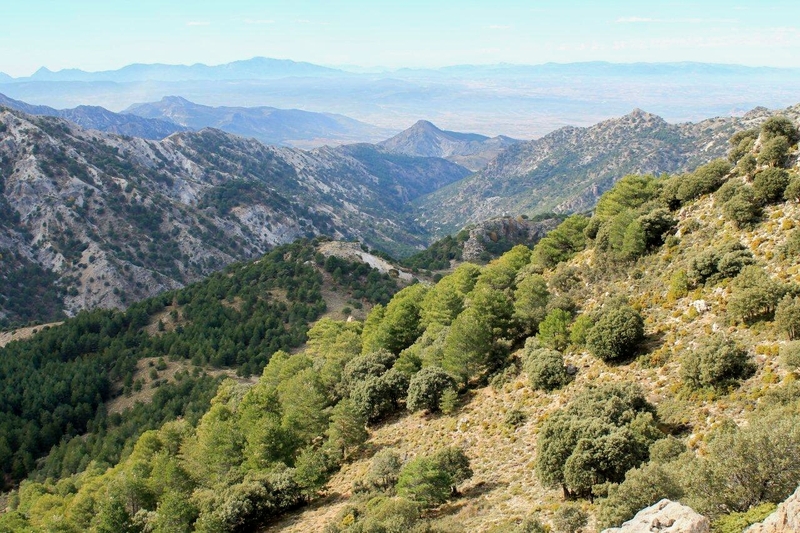 Spanish mountains – I just love them. It’s a while since I’ve been in the Pyrenees, but I hope to return in the not-too-distant future. And I have passed through the Picos de Europa – mountains that demand to be climbed. Bring on the sun, that’s what I say. Hi Loopwagon. Thank you very much for that. Hej Hanna. Time to dig out the winter socks. Hi Alen just caught up with you. Must go back. Have a dream that one day I’ll retire and tour southern Spain in early spring in a camper van. I suppose if you lived there various local customs would get on your nerves. They would have to be pretty serious to be as annoying as the tories mind. The song that gets me up dancing is Nutbush City Limits! Thanks for the mention in your blog. Greg, you always make me laugh. I thought about you the other day when I drove through Tebay in low cloud, dodging the traffic cones on the M6. Bloody things, they’ve been there for ages – just like the Tories. I’m still smiling at you dancing to Nutbush City Limits. There should be a mandatory Top 20 of songs that must be played at weddings for people in their fifties. Hang on to that camper van dream. 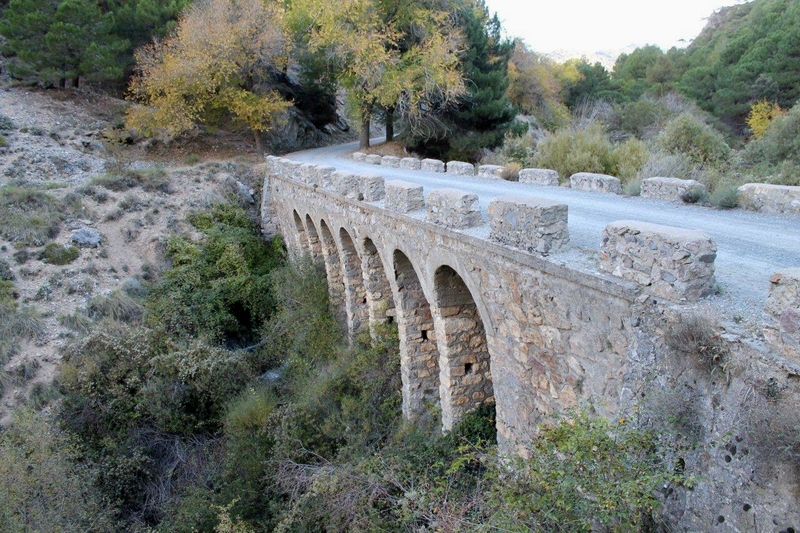 Alen, some nice photographs of a area I had not visited for many years. It is always nice to get away to try and hang on to the warmth as long as possible. While I would agree there are issues with Britain and there has been for years, not just the last few, I find it difficult to align your picture with what I see. I still see much good in the country and I travel regularly the length and breadth of the UK. It ain’t that great in Spain 26% unemployment and 56% youth unemployment and a economy in a real mess. Hiya Mark. Thanks for your comment. It’s always healthy for democracy to get an alternative view on these things. At least in Spain you can be miserable in the sunshine. What lies at the bottom of my grumbles in this post, and which I haven’t mentioned up to now, is that I’m expecting to be made redundant in the near future, so perhaps that has coloured my view of things. But that will be for another post. Hi Alen, I am really sorry to hear that. I have been there before and I hope that does not happen to you. I would not wish that on anyone. But you know that actually turned out to be the best thing that happened to me, although it didn’t feel like that at the time. A mortgage and year old son at the time really focuses your mind to find another job and this lead ultimately to me with two other colleagues buying the business I got the job in, but I guess that probably is something that most people in your situation don’t want to hear! You have a real skill in writing and observation and I am sure that will hold you in good stead. Thanks Mark. I appreciate that. I too have been made redundant before. So if it happens again I shall make the most of every opportunity. Alen, your images and passion for the environment are a real pleasure. This is made more poignant by your obvious and understandable anxiety. I am usually very optimistic, too. Recently, however, I am shocked at how terribly those made unemployed or who are less able to cope are being marginalised and denigrated. Best wishes, Alen. If decency and integrity were rewarded you’d be fine. Sadly, mate, the opposite seems to be the case far too often. Hi Chris. Thanks for that. We appear to be living in times when society is becoming increasingly polarised, where in order to succeed you have to be a member of the elite or a ruthless, power-hungry individual. Compassion and integrity are regarded as weaknesses by the ones who pull the strings. Anyway, it’s nearly Christmas. Blimey. I didn’t know that. At least neither of them spoils a couple, as the saying goes. Talk about all the bad apples in one barrel. Fantastic post about Baja Montana! Those excellent photo’s really took me back there and I enjoyed the story (especially the rant) immensely. Spain is indeed a wondrous place and now I’m in my fifties I too am thinking (not for the first time) “I could live there”. I only discovered your blog thanks to my daughter Andrea, who sent me a link to it after she stumbled upon it whilst surfing the ‘net “dreaming of Spain”. I’m glad she did. Hiya Andy. Good to hear from you. 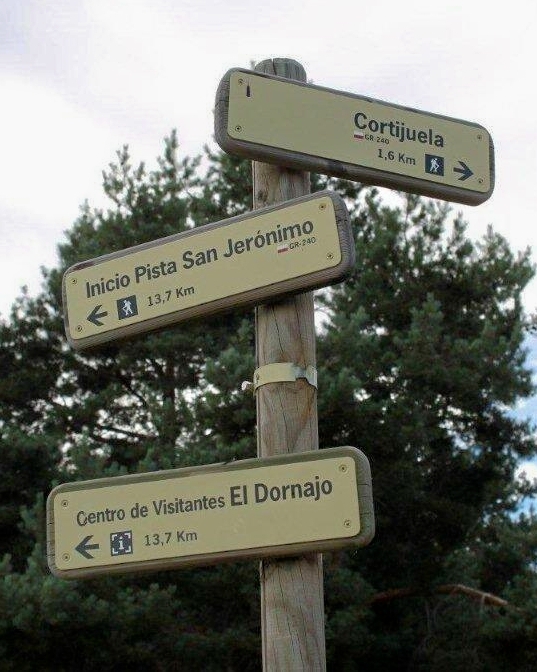 I bought your guidebook for my first visit to the Sierra Nevada and have used it on every subsequent occasion. You must really know your way about up there because those mountains are big and some of the walks long and arduous. I think I’ve mentioned your book on several posts, so perhaps it has helped to shift one or two copies for you. I hope so because I know a great deal of time and effort goes into compiling a guidebook like that. Pass on my regards to Andrea. And if you do decide to move out to Spain, and we decide to move too, we’ll have to meet up for a beer sometime. 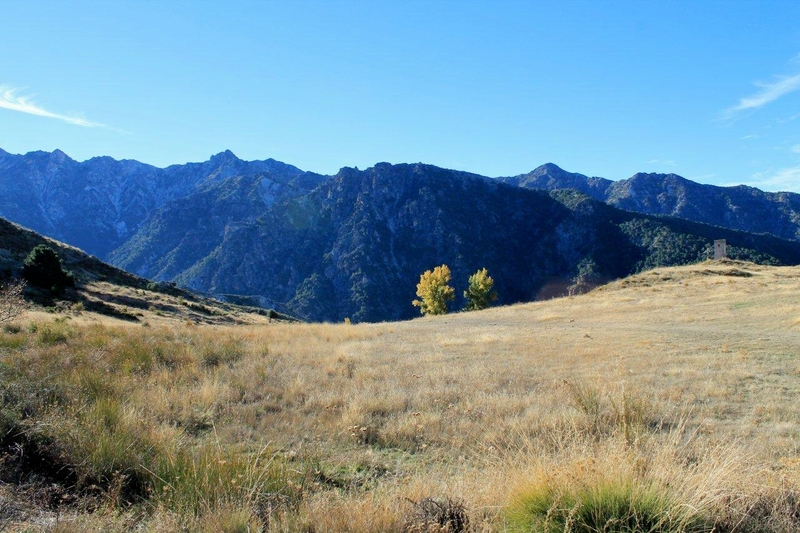 A beer in the Sierra… now you’re talking!